The Cherry Hills Community Church is a vibrant ministry that incorporates all aspects of media and technology to serve their expanding congregation. Their campus includes a 3,500 seat worship center, a 1,000 seat multipurpose atrium, a 400 seat chapel, two gyms, a preschool through jr.high school, a recording studio, and a video recording and production facility. From a music and production standpoint, Cherry Hills has established a reputation in the community and across the country of creativity in planning and excellence in execution. That excellence is a result of quality equipment, professional personnel, and a facility designed for flexibility and future expansion. 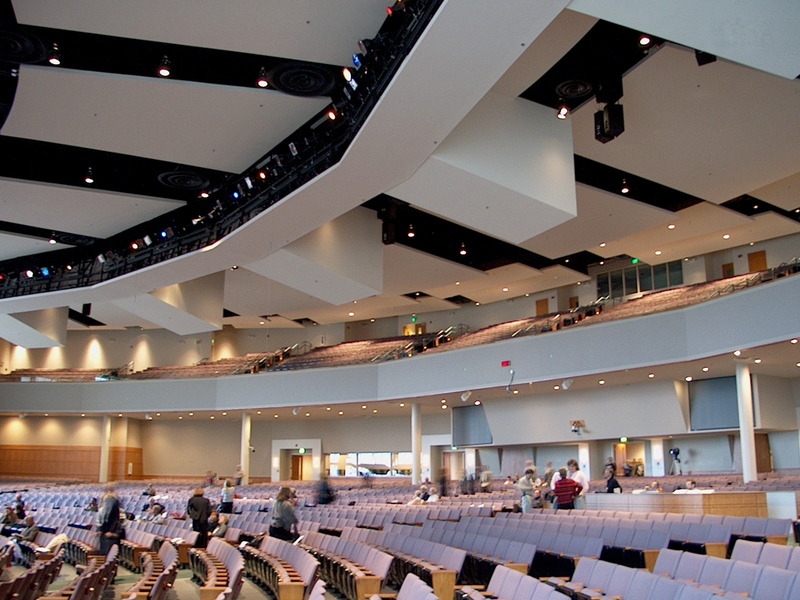 Sound Investment Enterprises has served as the church's acoustical and theatrical consultant and a/v system designer for all of their principle venues. With the ministry's strong commitment to technical excellence and flexibility, the Worship Center has incorporated many state-of-the-are functions and features that are typically found only in performing arts facilities. 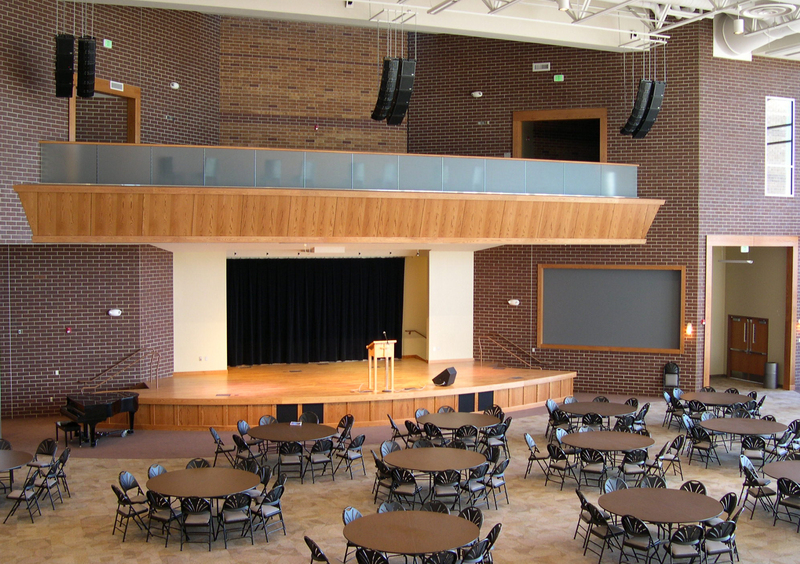 The Atrium Fellowship Center provides a multipurpose gathering space for events with up to 1,000 guests. Following the same strategy for flexibility and adaptable media that's incorporated into the Worship Center, the Atrium is outfitted with all of the technology systems needed for satellite-linked video seminars, training conferences, concerts, receptions, and banquets. With over 20 events scheduled in the Atrium every week, the sound, lighting, and video systems are designed for rapid reconfiguration via remote control wall panels by the media or facility staff. 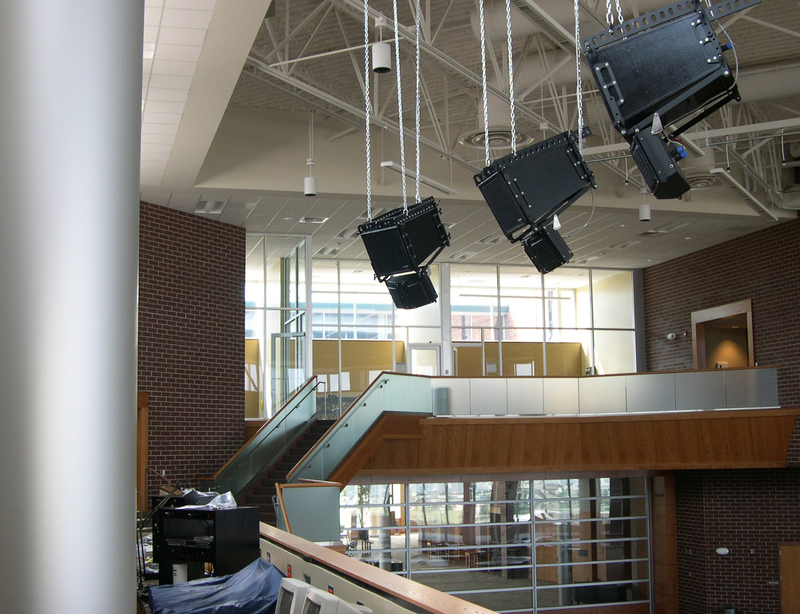 Events originating in the Atrium can be "broadcast" to other meeting spaces throughout the campus. 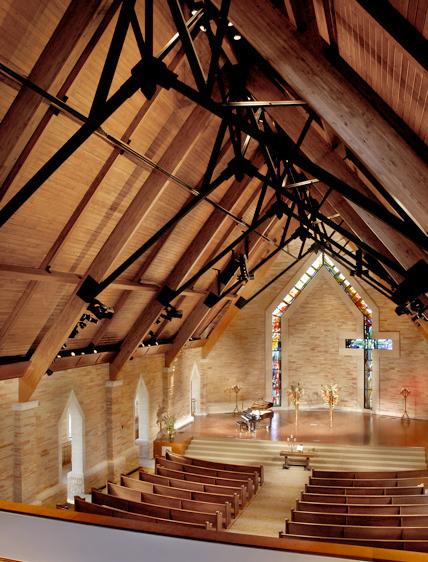 The Chapel's beautiful interior of stained glass windows, stone walls, and massive wooden beams conceals the exceptional technology that's been blended into the space. While the 400 seat Chapel presents a more formal setting than the Worship Center or Atrium, the media and production tools integrated into the facility provide a perfect place for smaller and more intimate concerts, seminars, weddings or funerals, or worship services. Certain architectural priorities dictated that the appearance of A/V and production components be kept in a low profile. With a wide variety of events planned for the Chapel, the church staff knew that moving equipment, instruments, and furniture on and off the stage would be a daily requirement. Therefore access to the elevated stage from the basement storage is provided by a theatrical stage lift, a passenger elevator, and an ADA ramp system. In addition, the Chapel's formal appearance called for video cameras to be discretely positioned at strategic locations about the room. 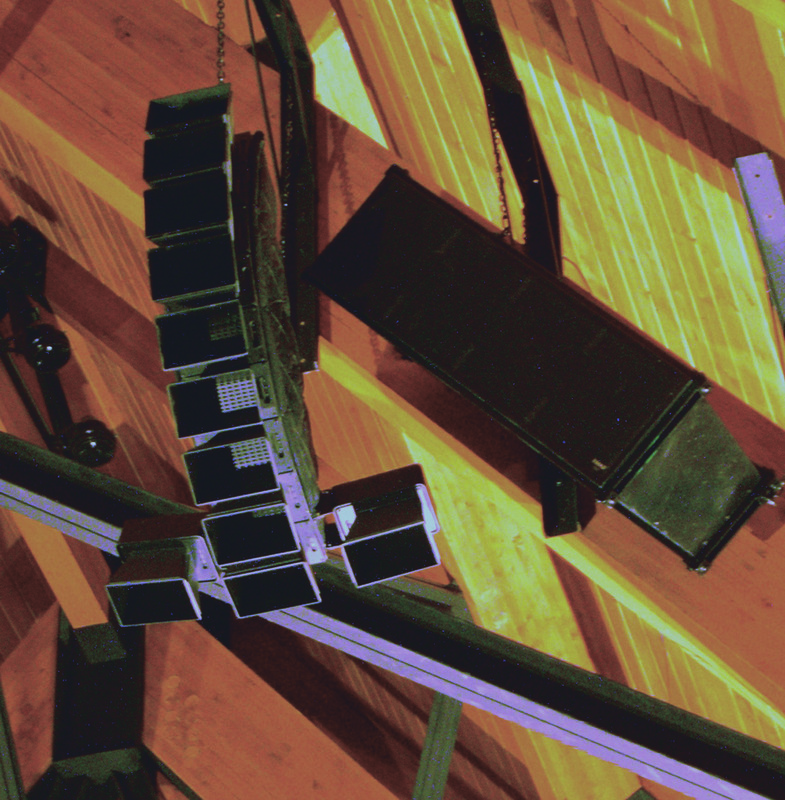 With control of low-profile robotic cameras, Chapel events are transmitted about the campus or streamed on the church's website. 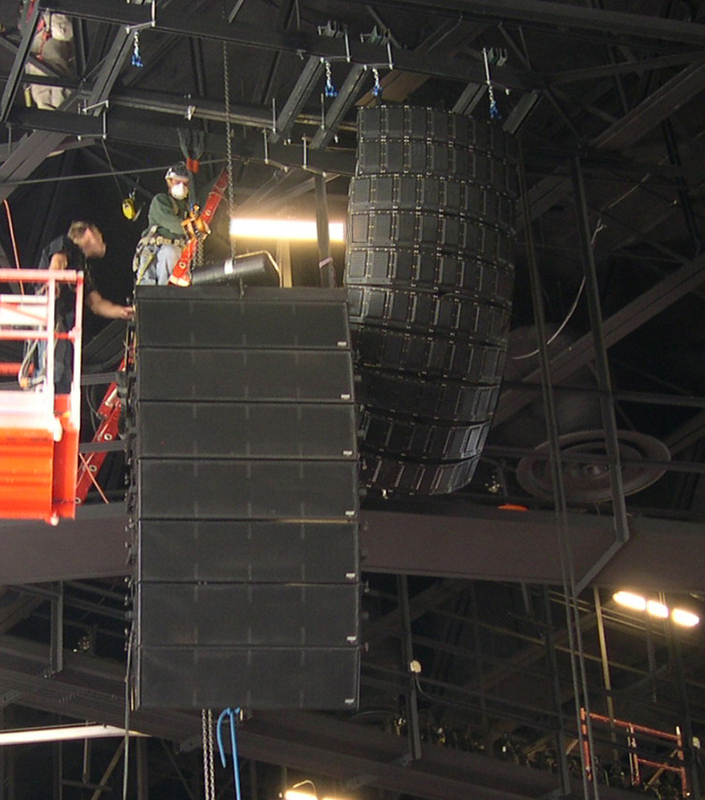 A 50 foot peak ceiling could make stage lighting adjustments challenging and time consuming. So several motorized lighting fixtures were selected to re-focus and re-color the stage lighting for any event. All of the interior and exterior lighting looks are stored in the console's memory so that they can be recalled for each event. One of two custom stereo arrays utilizing HPV Technologies MAD A-9 planar magnetic speakers.